Fulfilling your dreams of having a whiter smile is easier than you could ever imagine. Why do so many people desire whiter teeth? Because bright, white teeth are often associated with a youthful attractiveness. Teeth whitening is a noticeable, simple smile enhancement. Dr. Raymond Sheridan cites teeth whitening as one of his most popular cosmetic dentistry treatments for good reason — it takes just minutes, is highly affordable, and provides dramatic results. As part of your consultation, Dr. Sheridan will evaluate your current tooth coloring, age, skin tone and other factors to create a personalized plan, resulting in a shade that is both beautiful and appropriate. Teeth whitening is available through both in-office and out-of-office treatments. If you want dramatic teeth whitening as soon as possible, our in-office smile brightening session is our best offering. Dr. Sheridan uses the Zoom! whitening system to deliver marked improvements in just under an hour. 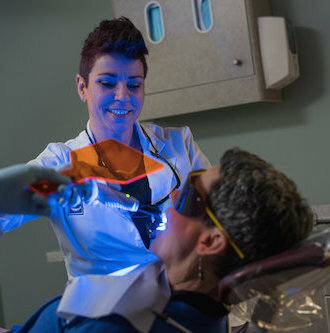 During this treatment, a strong bleaching agent is applied to the teeth. Its effects are activated with a safe lamp, which promotes deep absorption. Patients report up to an 8-shade improvement after the three in-office treatments. Each treatment usually lasts 15 minutes. For our patients who prefer an at-home approach, we offer the Opalescence Xtra Boost kit. For this treatment, Dr. Sheridan makes molds of your teeth, which are used to create custom whitening trays. You will be given instructions on how to place the gel in the trays and how long to wear them to achieve your desired level of whiteness. Take-home trays allow you to control the whitening levels, as well as the time of day you choose to whiten. Since at-home teeth whitening is the most popular option here at Sheridan Dental, in-office teeth whitening patients will also get take-home trays to use periodically for whitening touch-ups. For more information regarding your perfect whitening solution, contact our Grove City office. Dr. Sheridan and his team are happy to answer all of your cosmetic dentistry questions and assess your personal situation through a free consultation.